This free card model is offered by Bertschy's Paper Models, USA. 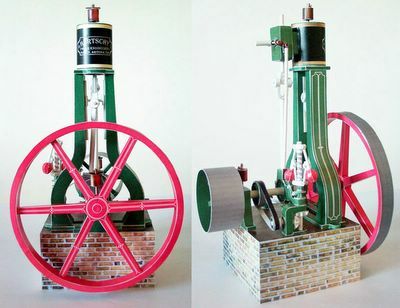 It is based on a CAD drawing of a Riches and Watts nominal 2½ horsepower vertical A-frame double acting simple slide-valve steam engine circa 1870-75. The CAD drawing was by Richard Adamek; the drawing is available as part of Richard's Old Engine House website. The model is fully working, and can be run on a puff of air. Warning: To view and print out this model, you must have a copy of Adobe Acrobat Reader installed on your computer. These parts sheets should be printed on cardstock; Ed recommended Classic Crest Cover Solar White Super Smooth cover stock. Sub 80/216g/m2. These parts sheets should be printed on preminum paper. Ed used Hammermill premium laser paper for color laser printers; I used HP Brochure and Flyer Paper on my inkjet printer. If you are interested in learning more about stationary steam engines, then please consider becoming a member of I.S.S.E.S..